For days, now, the Web has been sizzling with news that the long-sought Higgs boson  the particle that theorists think gives other particles their mass  might have been discovered at last. The Higgs, also known as the God particle, was evidently hiding in a bunch of subatomic debris, like a robbery suspect crouching in a Dumpster, at the European Large Hadron Collider (LHC) particle accelerator. Such astonishing news hasn't been heard in the physics community since ... last year, actually. That's the most recent time the Higgs might have been discovered (but wasn't)  in that case, at the Tevatron accelerator near Chicago. A month or so ago, an entirely different but equally amazing particle that could have rewritten the laws of physics might have been discovered at Tevatron (but, as far as we know, wasn't). If there seems to be a theme here, there is  and it's not that particle physicists love to make dramatic claims for which there's no actual evidence. The truth is that making discoveries at the very edge of physics is really hard. (If it were easy, after all, we'd already have made them.) That's why you need multibillion-dollar accelerators that whip particles nearly to the speed of light or giant telescopes stationed in space. And even then, the observations are so difficult to make that it's not always clear what you're looking at. Is that teeny blip of light the most distant galaxy ever seen or is it a glitch in the electronics? Questions like that are incredibly difficult to answer, and with particle physics they're even harder, because you're not even looking for the thing itself. You're looking for the effect of the thing  the suspicious movement of the tall grass as opposed to the actual tiger hiding in it. The inferential nature of such evidence doesn't mean your quarry isn't there, but it doesn't mean it is either. So when physicists at the LHC recently saw some subatomic grass waving in their detectors, they suggested in an internal memo that it might be evidence that a Higgs boson had passed through. 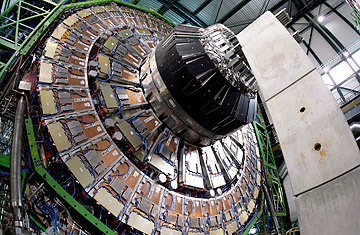 It wasn't even close to a solid detection, though, which the LHC physicists knew perfectly well. It was a hint, nothing more. Their e-mail exchanges about the new data were supposed to be private and nothing like a public announcement  a wise choice, given what happens when discoveries are announced prematurely. But the e-mail was leaked somehow. It wound up on the Not Even Wrong blog, run by Columbia University physicist Peter Woit. (The title refers to string theory, which Woit thinks isn't even plausible enough to need refuting  something that surely doesn't thrill his Columbia colleague Brian Greene.) Says Woit: "Best guess is that [the Higgs rumor] is either a hoax or something that will disappear on further analysis." The hoax part isn't very generous, but the disappearing part is quite likely. Scientists have made all sorts of observations through history that on further analysis have turned out to be false alarms  the mistaken "discovery" back in the 1960s of a planet orbiting Barnard's Star, for example. But they've also made observations that seemed far-fetched but turned out to be hugely important, like Fritz Zwicky's improbable idea of "missing mass" back in the 1930s, which is now a fully mainstream concept better known as dark matter. So this detection could turn out to be the real thing, but that will be clear only in retrospect, and it may take years. In the meantime, those who can't get enough of "May have been found! (or may not)" stories can visit New Scientist magazine, the British science weekly that delights in publishing stories about these legitimate but very tentative discoveries. Prepare to be amazed  or not. See TIME's "10 Ideas That Will Change the World."